From MinnPost: “Watching the 911 dashboard, Officer Colleen Ryan saw it again: The address of a woman who calls Minneapolis police frequently during bursts of life-threatening anxiety. Ryan notified her partner—a social worker—and the two drove to the woman in an unmarked police car. No sirens. No flashing lights. But this time around, Ryan wanted to do something different to help the woman, beyond their typical routine of giving her a ride to a hospital. So Ryan and her partner sat down with the woman… and played a game of Yahtzee. 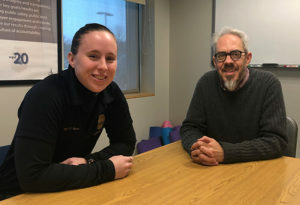 And after 45 minutes of rolling the dice, the woman felt comfortable describing to Ryan and the social worker—a duo formally known as a mental-health co-responder team—her feelings. From there, the team shared tips and resources with the woman for if, or when, anxiety overcomes her again. Wow, what a concept! That was the opposite of my experience with police when I was minding my own business, watching the clouds, peacefully lying in a public park, trying to mentally come to grips with the reality that I had found the medical proof that the antipsychotics can create psychosis, via anticholinergic toxidrome. I was medically unnecessarily taken to a hospital by the policeman, given a $5000 physical against my will, which resulted in a “medically clear” diagnosis. I had refused to sign HIPPA forms, since I did not need a physical. I was held until midnight in that hospital, then medically unnecessarily shipped a long distance to a psychiatrist that was NOT my last psychiatrist. But a psychiatrist who was a “snowing” partner in crime with this now FBI convicted criminal doctor. The good thing was that once I’d pointed out to the hospital that medically unnecessarily shipped me to that criminal psychiatrist, without having signed HIPPA forms. That hospital did stop requesting payment. When you point out the crimes of the doctors, the hospitals do tend to get embarrassed. Let’s hope the police and paramedics stop behaving like insane people. Medically unnecessarily, illegally, and willy nilly dragging healthy people out of the comfort of their own beds, or for lying in a public park, and taking them to criminal doctors in hospitals. Have the police and paramedics been getting kickbacks from the criminal doctors for this type of illegal behavior? One has to wonder. I have had acquaintances tell about police breaking into their homes with guns drawn though they weren’t breaking the law or violent. Why? Suicide calls. As dumb as it gets. Reminds me of a Gilbert and Sullivan opera where a man is going to be executed for attempted suicide. Dumb, dumber, dumbest….